Peanut Butter Fudge Bars, like other cake mix cookie recipes, are timesavers. The cake mix makes putting together the recipe easy because the mix saves you steps. Yet simplicity cannot hide this recipe’s delectable combination of peanut butter and chocolate. 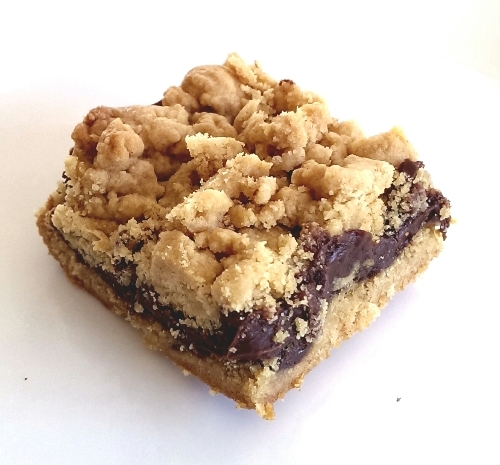 These bar cookies taste like a baked version of Reese’s Peanut Butter Cups. Preheat oven to 350º F. Line a 13 x 9 baking pan with aluminum foil. Spray or grease the foil. Set pan aside. In a large mixing bowl, using an electric mixer on low speed, combine cake mix, peanut butter, eggs, and vegetable oil. Blend for 1-2 minutes until dough is moistened and dry ingredients have been well absorbed. Set aside 1½ cups of the cookie dough. Spread the remaining mixture into the prepared pan, pressing it evenly to make a crust. Pour chocolate chips and sweetened condensed milk into a microwave-safe bowl. Cook on high for about 1 – 1 ½ minutes until melted, stirring with a spatula every 30 seconds until smooth. Remove from the microwave. Stir in vanilla extract. Pour the chocolate filling mixture over cookie crust. Sprinkle reserved cookie dough evenly over chocolate filling. Bake bars 20-25 minutes until set and crumb surface begins to become slightly golden brown. Remove the pan from the oven and allow it to cool completely on a wire rack. Cut bars into ¾-inch by 1-inch fingers. Store cookies in an airtight container using waxed paper or parchment paper to separate layers. As you prepare the Peanut Butter Fudge Bars dough, do not over mix. Instead, simply allow peanut butter, eggs, and oil to be absorbed and then stop blending when the mixture becomes moistened crumbs. The dough for the crust will press easily into the pan regardless of how tightly it is blended. But if you beat the mixture beyond its basic moistening, allowing it to pull away from the sides of the bowl into a ball, then the reserved mixture will be too sticky to sprinkle easily as topping over the chocolate filling.